Tessie King thought she knew all there was to know about tracking down bad guys after helping to find her father’s killer. 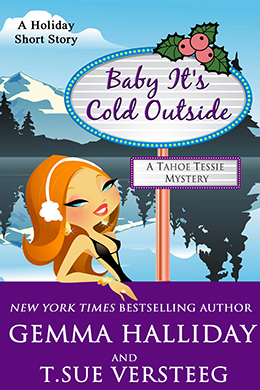 But when she’s locked out of the Royal Palace Casino in South Lake Tahoe during an ice storm, she’s suddenly faced with the task of tracking her own would-be assassin. It’s Christmas Eve, the town is encased in ice, and it’s impossible to get an officer to respond without a dead body. With besties Tate and Britton in tow—and head of security, Alfie, desperately trying to keep track of all three—they set out to find the person responsible. Will they find the attempted murderer before he can finish the job? Or will Santa be returning Tessie’s gifts this year? I tried yoga breathing. I tried to find my mental happy place on a secluded tropical beach. I tried to roll my shoulders and crack my neck. Nothing worked. As the service elevator doors opened to the noisy, bustling kitchen, I was still ready to fire everyone just for funsies. Wide-eyed staff snapped to attention, whipping around to face me. None of them had ever heard me talk this way, so I was pretty sure they knew I wasn’t playing games. Finally, a shift supervisor was brave enough to come forward. “Is cold.” He hugged his sides and shivered as though I didn’t understand his heavily accented words. “Too much hail. No take trash out.” He waved his hand from the stinky, heaping trash cart to the back door. Afraid of saying or doing something I’d undoubtedly regret later, I stormed over to the trash cart, scattering the entire staff into any room but the one I was occupying. It would take all of five minutes to empty the damn thing myself. I pushed against the door leading into the alley, but the heavy onslaught of wind and hail pushed back. I flung by body against the door, and it gave a tiny bit. Taking a run at it, I smacked into it yet again, giving way, flinging me out into the icy night air. It scraped back against the ice crusted ground, almost closing on me. I huffed a cloudy sigh of mild annoyance, reaching for the door to prop it open just a tiny bit. It slid shut in front of me, the lock clicking into place from the other side. Shock jolted through my body, my hands dropping to my sides, as I stared at the door. Surely it latched automatically. My visible breaths came quicker as adrenaline fueled panic flooded my body, as I banged desperately on the door. Every inhalation burned, and I could feel my clothing quickly getting soaked by the pounding ice and snow. My exposed skin was drenched in second. Thankfully, I’d chosen pants that morning instead of my usual skirt, but they were quickly becoming drenched as well, clinging to my body like an icy second skin. Had I penciled in getting locked outside in a hailstorm, I’d have gone with sensible dress shoes instead of my Manolos. And a parka. And gloves. My hands and feet tingled, quickly becoming numb. I waved frantically in front of the camera that monitored the alley, hoping someone, anyone, was watching. “Hello? !” I screamed at the top of my lungs while banging on the door again. I reached my quivering hand into my blazer pocket… And realized that in my haste to get downstairs I’d left my phone in the penthouse. Fabulous. Trembling, I tucked my hands under my arms and screamed again. Nothing really recognizable, just shrieks in hopes of getting someone’s attention. I backed into the corner next to the door to block as much of the wind and sizeable hailstones as I could. I’m not sure how long I sat there, but it didn’t take long before every part of me was either completely numb or tingling, on its way there. The high, frigid winds still found a way to whip around me. Sleet pelted my face as I slid down the coarse brick wall, tucking my feet under me to warm them. I had a momentary spark of remorse at the thought of scuffing my shoes, but this was an emergency worthy of it, if there ever was one. I could no longer feel my nose, and my eyelids were sticking together with each blink. I screamed one last time, willing myself not to cry. Tears would so not be a good thing. My mind wandered, contemplating how long it would take for hypothermia to set in. I stared at the door, a small barrier between living and dying. There really was going to be a dead body.